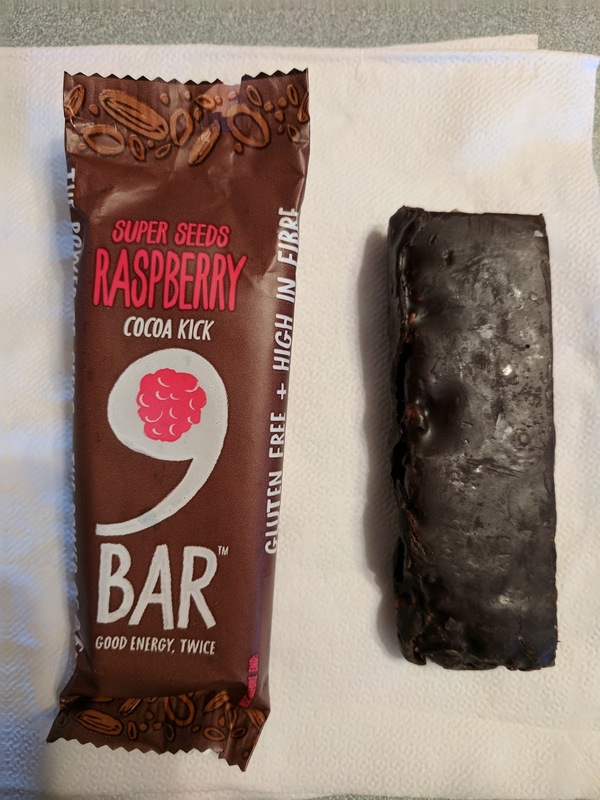 9 Bar is a snack bar manufacturer from the UK, producing bars based on their "super-seed" base, of sunflower, pumpkin, sesame and hemp seeds. They make 4 different product lines. The "Original Lift" series I believe is the first line they made, and includes mix-ins like cashews, almonds, brazil nuts, and pumpkin. Slightly more interesting is the "Carob Hit" line, again with a super-seed base, obviously carob, and other mix-ins like flax, pumpkin, apricots, dates, and chia. I'm not quite sure what is breakfasty about the "Breakfast Boost" range, but these include dried fruits (apricot, strawberry, raspberry, raisins) and oats in the base. I guess oats are for breakfast? The most exciting line is "Cocoa Kick", available in 4 flavors: hazelnut, coconut, raspberry, and cashew, all of which have a super-seed base, cocoa mixed in, and a chocolate layer on top. I went for the raspberry. "The super-seed goodness of sunflower, pumpkin, sesame and hemp combined with indulgent cocoa and tangy raspberry with a delicious chocolate-flavoured topping." I almost liked this bar. The layer of chocolate on top was dark chocolate and seemed to be decent quality. It was thick and generous, and didn't leave me wanting for more. The seed mix had cocoa mixed in as well, so, this delivered in the chocolately department, I did indeed get my "cocoa kick". The raspberry flavor went well with the chocolate, but, I really didn't care for the raspberry seeds. I have this problem with raspberries and blackberries, I just can't stand the seeds when I eat the fruits, and here there was tons of raspberry seeds mixed in. That was off-putting to me. But finally, I just didn't like the flavor of the seed mix, predominantly sunflower seeds. A bit bitter, and just not a taste I like. So, not the bar for me. If you like seeds (both sunflower AND raspberry), then perhaps this is the bar for you. I'll admit it, I totally forgot about Red Dog, even though I was excited when I heard it was opening several years ago. I was familiar with the chef from her role at Il Cane Rosso, and I was really happy she was opening her own restaurant. I went once to get takeout brunch , and then ... uh , I forgot about it. Which is sad, given that it only a block from my house. I think the restaurant is suffering from people forgetting about it, and is trying to get back in touch with the neighborhood, so they invited my apartment building for a party. They reserved an entire private area for us, on a Saturday night, from 6:30pm-8:30pm. They brought us tons of food, and unlimited drinks, free of charge. I appreciated it, for sure, but, I couldn't help but wonder why they were doing this for us. Red Dog is open every day for lunch and dinner, plus brunch on weekends. They have Happy Hours every day of the week from 3pm-7pm. My visit was a Saturday night, and the restaurant had only a handful of tables occupied in the main room during that entire time. Maybe lunch is busy during the week with all the businesses nearby? Maybe they do a good weekend brunch? Otherwise, I really don't understand how they can still be open all these hours? The dinner menu is broken into 4 categories: "getting started", "vegetables", "house-made pasta", and "entrees". At our event, we were served items from the first 3 categories, plus off-menu pizza and Happy Hour specials. It was a nice spread, and everything was fairly good. Well prepared, well seasoned, but mostly a bit uninteresting. There was one standout dish however, that I would return for. 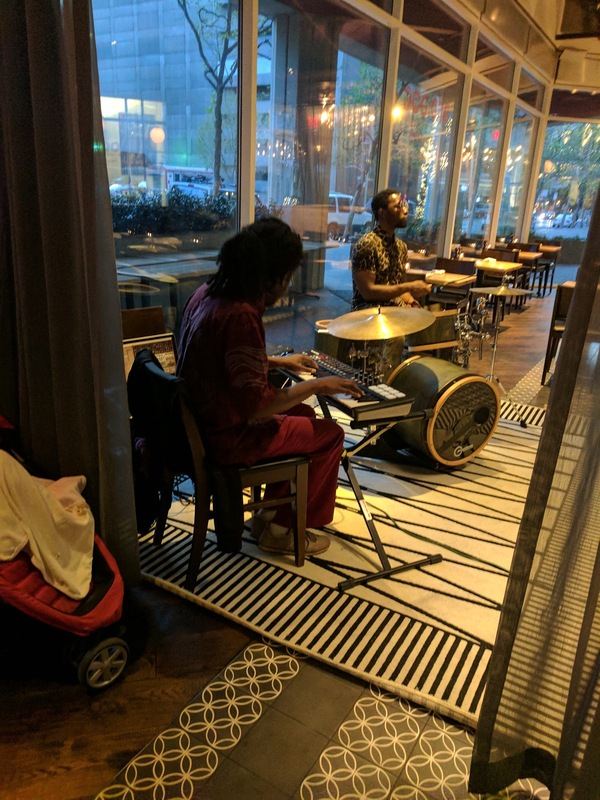 On Friday and Saturday nights, they feature a live jazz band starting at 7pm. Again, I thought this was really nice, but, couldn't help but wonder about it. How can they pay a band when there are only a handful of occupied tables? It did make for a lovely atmosphere though. Grayhound / Vodka / Grapefruit. Our hosts had selected a sparkling, a white, and a red wine, a handful of beers, and a single cocktail for us to pick from. I started with the cocktail, a grayhound. It was good, simple, but well made, and nicely balanced. I was impressed that it wasn't too tart, but the vodka also wasn't too strong. I moved on to the red wine selection (grenache) and wasn't such a fan, and wished I had just stuck with the cocktail. I'd love to try some of their signature cocktails next. 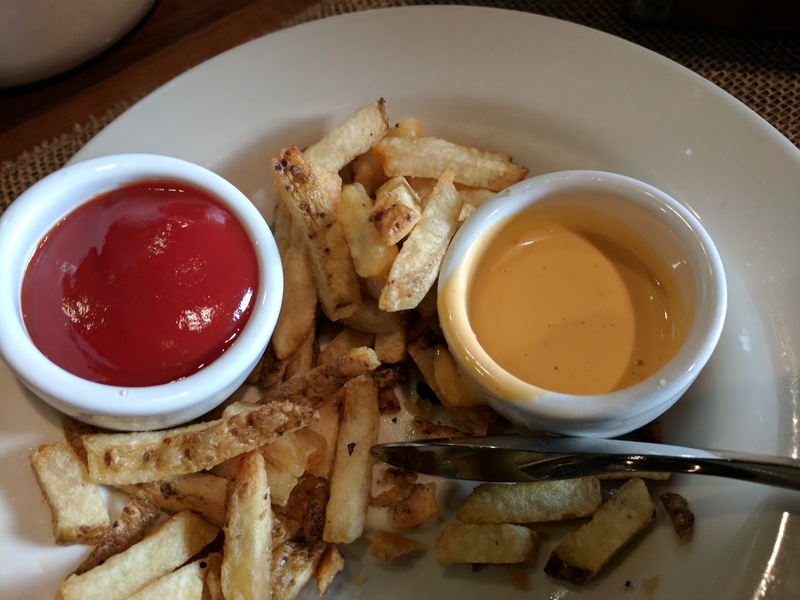 House-cut Kennebec Fries / Curry Ketchup / Spicy Aioli. $5. The fries came from the "getting started" section of the menu. It is the only dish we had from the "getting started" section, which I was a bit disappointed by, as I really wanted to try their most famous dish, the deviled ham scotch egg, and the signature house-made rustic beer bread with honey butter. Alas, I'll need to return to order them myself sometime. The fries were fine, crispy enough, skin on, but, not particularly interesting. I did not try the curry ketchup, but the spicy aioli was good, it did indeed have a bit of a kick to it. Overall, fine, but not remarkable fries. My second to last pick of the night, and I wouldn't get them again. 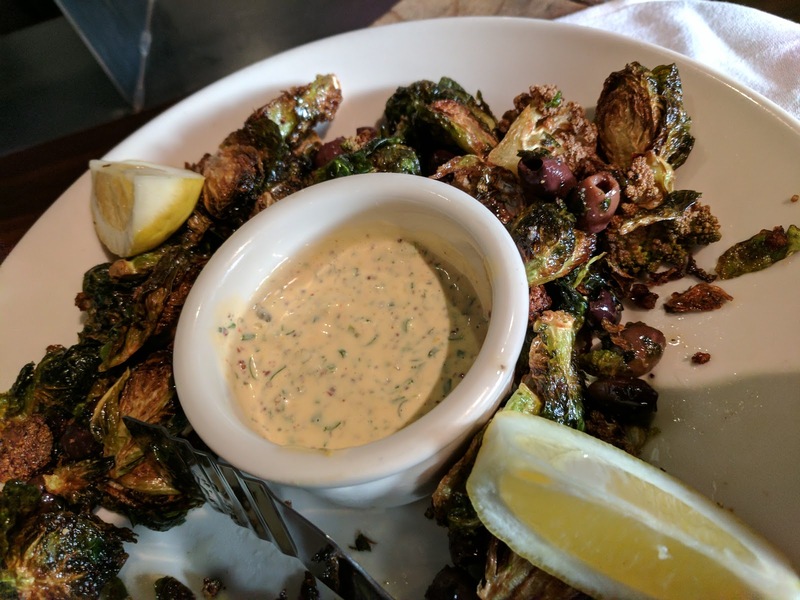 Crispy Brussels Sprouts & Romenesco / taggiasca olives / lemon / remoulade. $7. Next we had crispy veggies, from the vegetables section of the menu. This menu section featured items I'd consider first courses like soup and salads, plus dishes that seemed more like sides like sauteed swiss chard and grilled asparagus, and this, which really seemed like an appetizer. It was the only veggie dish we received. This dish was awesome. Dish of the night, hands down. I loved it, and was thrilled that they kept bringing us fresh orders. I certainly uh, ate my vegetables this night. But this was not a healthy veggie dish, obviously. The veggies were fried, very fried. They clearly soaked up a ton of oil. But, that is what made them delicious. I really enjoyed both the brussels (particularly the crispy leaves) and the romanesco (softer, more juicy). I didn't particularly want the olives, but they were fine. I loved the remoulade. It was fantastic. Seriously, really, really excellent remoulade. I liked the bits in it, I appreciated the slightly spicy flavor, and it was just a wonderful compliment to the veggies, although, actually, the veggies were tasty enough that they didn't need it. Was this a perfect dish? Nah. The veggies weren't actually that crispy, and they did have too much oil. But I really liked it, regardless. I'd get it again. 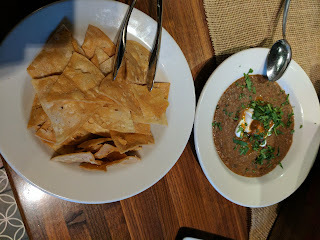 Chilaquiles Dip / refried beans / juanito’s salsa / poached egg / house-made chips. $6. Chilaquiles is featured on the Happy Hour menu, with a larger version with multiple eggs is also on the brunch menu. The housemade chips were ok, a bit oily, but they had a good flavor to them. The dip itself was, well, beans, which I'm not particularly fond of. I did like that it was mostly smooth but still had bits of beans for texture, and it was well spiced, a fairly complex flavor. The poached egg seemed strange for a Happy Hour / appetizer item, although I think it would be fine for brunch. I felt this dish didn't quite hit the mark and seemed a bit confused / trying to hard, but I know my opinion is tainted in that I don't like beans or eggs much. My least favorite dish. Pizzas, er flatbreads, aren't on the regular menu anywhere, but, we had many of these brought out throughout the night. 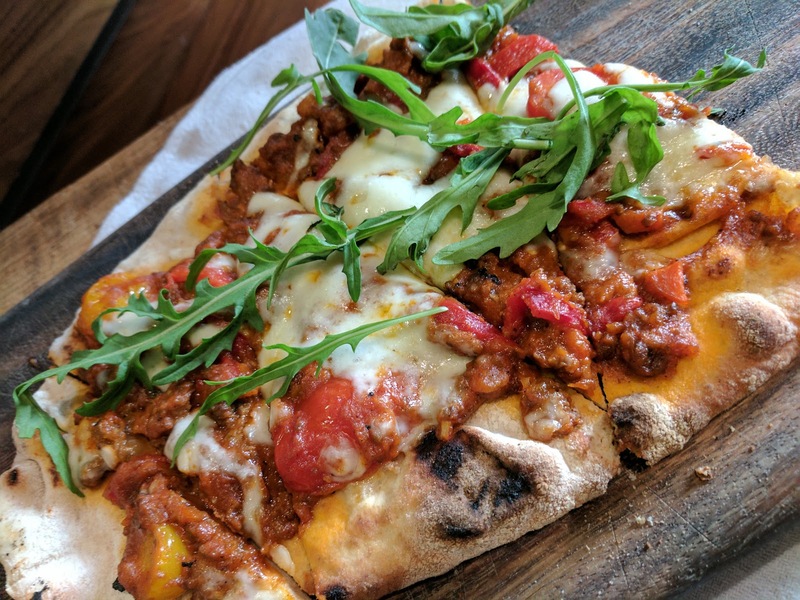 It came topped with roasted cherry tomatoes, some kind of meat, melty cheese, and arugula on top. It was decent pizza, crispy crust, flavorful toppings, and I really liked the fresh perfectly melty cheese. It might have been crescenza, like showed up in the pasta dish? I even liked the arugula on top for added freshness. My second favorite dish, although I wouldn't necessarily get it again. Rosemary Pappardelle / pork & cabbage sugo / piquillo peppers / crescenza cheese. $19. The "house-made pasta" section contains only two items, a vegetarian farro spaghetti, and this pappardelle. We had only this one. It was pretty good. 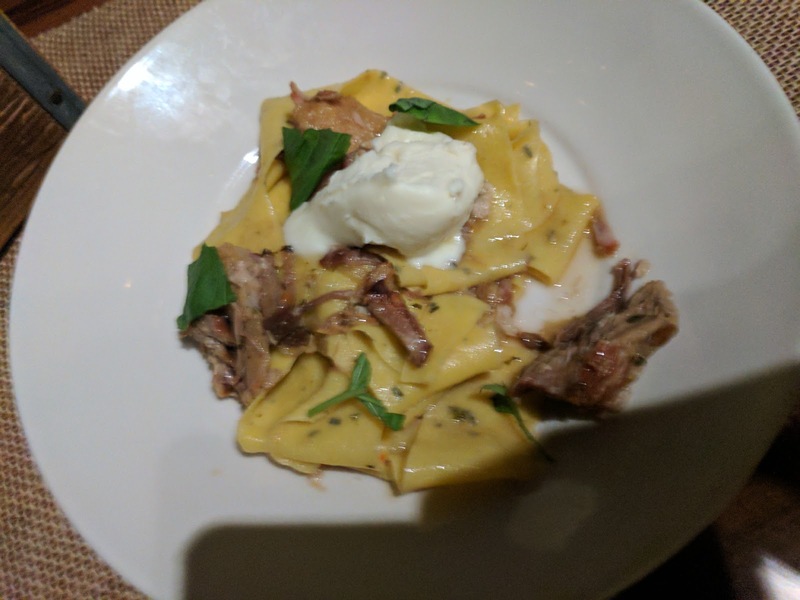 The pasta seemed like fresh pasta, large sheets of egg noodles, decently cooked. I love crescenza, so the big glob of cheese was most welcome, although it didn't really melt into the dish very well. The pork was soft and tender. Overall, this was fine, although it didn't have much flavor nor complexity to it. Still, I appreciated fresh pasta and I did like the cheese. My third pick, middle of the road, I wouldn't get it again. Last week I reviewed Il Cane Rosso, the fast casual restaurant of chef Lauren Kiino, located on the Embarcadero, in the Ferry Building. That establishment was originally part of the Daniel Patterson group, although I think chef Kiino was the head chef there from day one. But this past year, she opened her own restaurant from scratch, down the street in the other direction from my house: Red Dog. The astute reader may notice the naming: Cane Rosso/Red Dog. 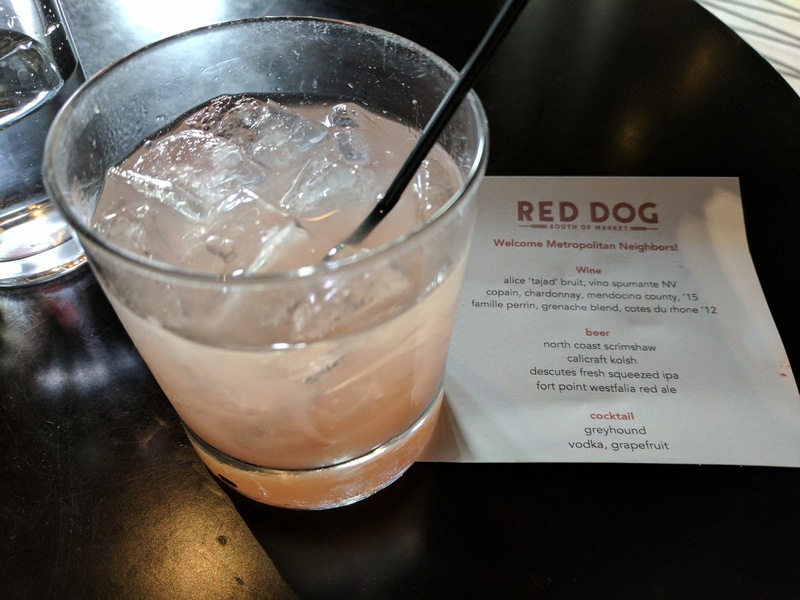 Red Dog in many ways feels like a slightly more grown up version of Il Cane Rosso. 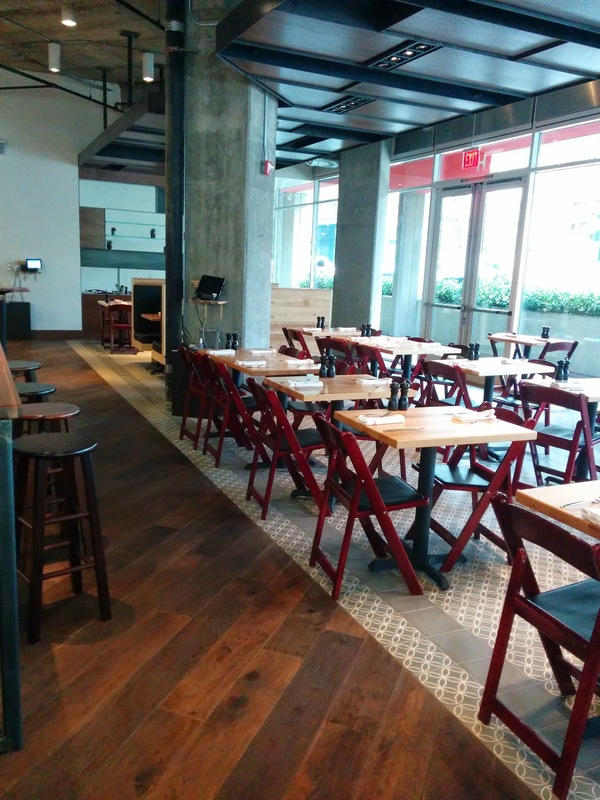 It is a full service restaurant, unlike Il Cane Rosso, but it is still comfortable and casual. The focus on local, seasonal ingredients, and Californian cuisine is there, but this time, in an environment where the cuisine can be more refined. They are open for lunch and dinner daily, and brunch on weekends (when they first opened, they were open for breakfast during the week too, which is when I visited). The space is beautiful, in a casual way. Bright, light-filled, open, airy, with gorgeous wood tones throughout. I can't even count how many different colors and styles of wood I saw; the table tops were made from blond, narrow planks, the chairs from a darker wood, and floors were made of wide, dark planks. It was stunning, in a modern rustic way. 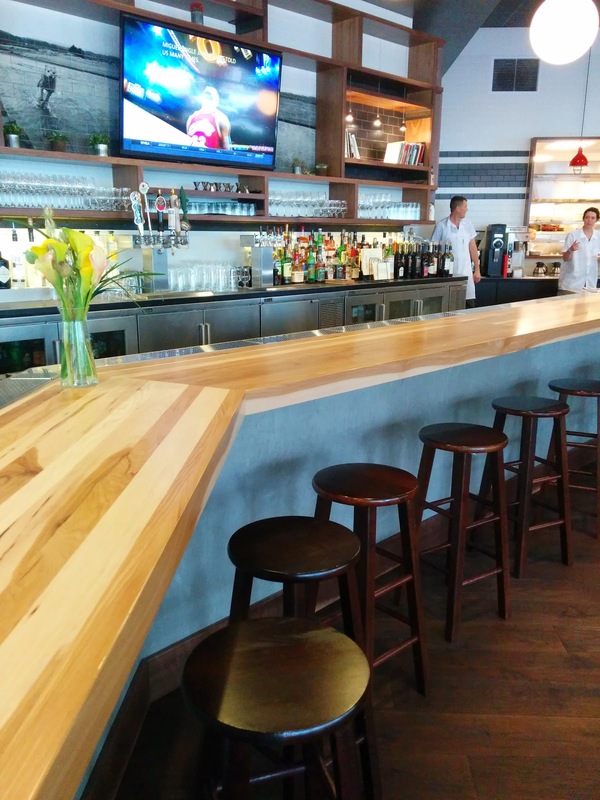 The wood tones are carried through to the bar area, with the same lighter colored wood is used for the bar, and darker tones used for the stools. 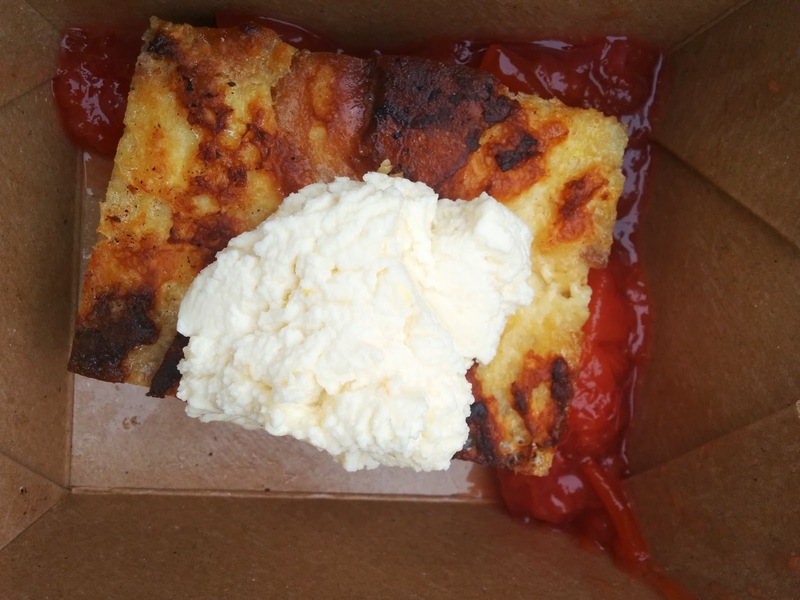 Small Griddled French Toast: l emon fromage blanc, pluot compote. $7. After a short wait, and some excellent coffee, I was presented with my to go bag. The packaging was nicely done - utensils included, plentiful high-quality napkins provided, all in a nice paper bag with handles. I imagine given the location in an office park, with such nice seating areas around outside, that take out is fairly common. I was a bit surprised when I opened the box. I did not see any slices of bread, which is uh, what I think of as french toast. Instead, it was more like bread pudding. A very thick slice, moist inside, slightly eggy. Moderate spicing, I detected at least a little cinnamon. What I loved was the griddled aspect - it provided a smokiness, almost burnt, but not quite. The griddle also gave a lovely crust. Something I always care about with bread puddings is having a crispy exterior and a moist, custardy interior, and they nailed that in a unique way with this preparation. On top was a good sized scoop of lemon fromage blanc. At first I was a bit disappointed by it, as it was tangy, and not very sweetened. In my mind, when I'm getting french toast, I somewhat expect it to be a sugar bomb, all drenched in maple syrup or sweet fruit sauces, topped with sweetened whipped cream. But once I re-adjusted my expectations, I quickly fell in love with it. The texture was a bit more like ricotta than a smooth cream, but the tang was remarkable, and really made it feel like I wasn't eating dessert for breakfast. Not that I have a problem with dessert for breakfast, but it makes it more of an acceptable "everyday" dish. On the side was fruit compote, made from pluots. It provided some of the sweetness that I was looking for, but it was not overly sweet. There was a generous amount of this provided as well. The pluot compote and fromage blanc made for a lovely combination, almost reminding me of a yogurt and fruit parfait. Overall, this is not at all what I was expecting from the name french toast, but I really did enjoy it. I'd get it again, but would rather explore more of the menu first. The $7 price was remarkably reasonable for a very well thought out dish. This was the small size, it is also available as two "slices" for $12. As I've done with most major cities I travel to, such as Paris, Munich, Boston, New Hampshire, Lisbon, Tokyo, Sydney and London, I like to write a master post of my coverage of the city. My ventures to New York were entirely too brief, so, this isn't a very impressive listing, but I'll add to it over time. Glorious, glorious soft serve and cookies from Momofuku Milk Bar. Butter noodles of my dreams, at Momofuku Nishi. Casual noodles and delicious tea at Xi'an Famous Foods. Incredible, truly stunning, breakfast at The Lamb's Club. Morimoto ... nothing amazing, but decent enough. JetBlue Mint 615, JFK-SFO, May 2017. In which I was ruined for all future air travel. JetBlue Mint 1415, JFK-SFO, June 2018. Renaissance New York Midtown Hotel Concierge Lounge. Mediocre food, the worst coffee ever. Munchery continues to pivot and try to find the right balance of offerings to be successful. I'm honestly fairly impressed at how much the company has transformed over the years. If you have no idea what I'm talking about, go read any of my previous Munchery reviews, where I've reviewed everything from an impressive version of Heston Blumenthal's World-Famous Chocolate and Cauliflower Risotto, to their partnership with local Indian restaurant Dosa, to totally amazing stuffed shells I still drool over, to simple comfort foods like fish sticks and bacon wrapped meatloaf, to even a full Thanksgiving dinner, and much, much more. 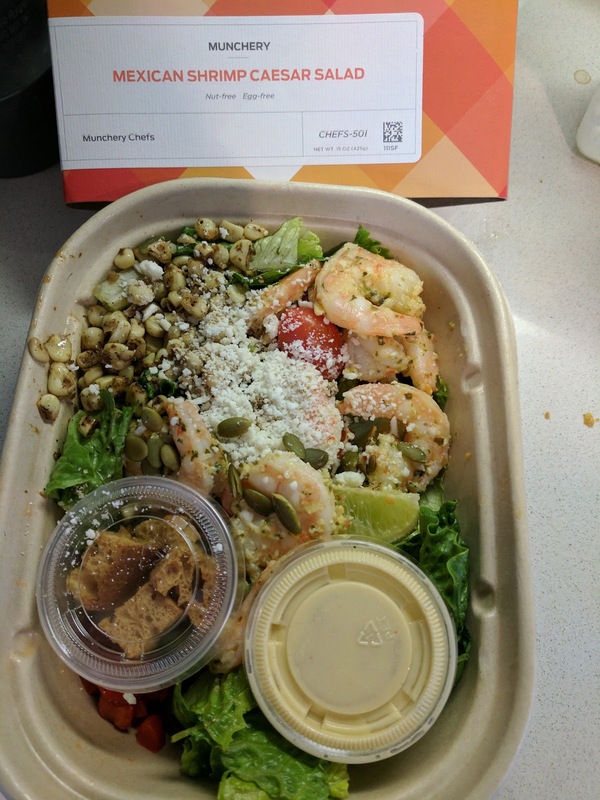 Since my earlier reviews, Munchery added cooking kits for those who do want to do some prep, but no shopping, they've added children's meals to accommodate whole families (or smaller appetites), they've partnered with local juice shops, they've added better desserts and ceased making them in-house. They've also really increased their healthy, trendy offerings, with numerous salads, poke bowls, and grain bowls. Salads aren't usually that interesting to me, but, for some reason, I went through a phase of craving salads on weekend evenings. 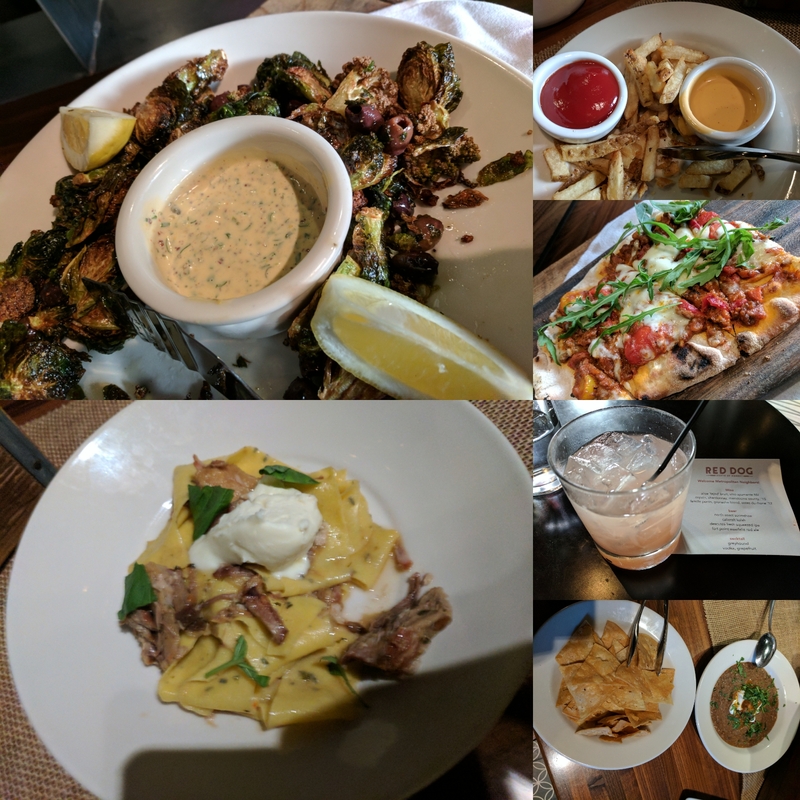 Don't get me wrong, I wasn't really on a health kick, I also wanted a big slice of cheesecake and a chunk of cornbread with honey butter alongside, and I started my days with weekend brunch of pancakes, waffles, and the like, but, I kept finding myself strangely wanting salads in the evenings. Luckily for me, Munchery was able to satisfy these cravings with numerous salads to pick from, both entree sized and side salads, nearly every day. Oh, and they have fantastic desserts too (more on that soon), so, I could satisfy all my needs. If you'd like to try it yourself, just use my referral code and get $20 off your first order! 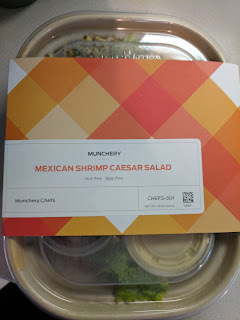 So finally I caved and ordered a salad from Munchery, not really sure what to expect in terms of quality for something where freshness and quality produce matter. I was drawn in by a caesar (always a favorite of mine) that came with all sorts of interesting "Mexican" ingredients. It came in standard Munchery packaging: compostable base, plastic lid, colorful labeling with instructions ("Pour dressing and croutons over salad and mix"), ingredients, and nutritional information (470 calories) clearly presented. The stock photo looked like a well rounded salad, and, actually, what I received it was decently represented, sans nice plating of course. My salad had the same number of shrimp, although far, far fewer croutons and cherry tomatoes. And, uh, my corn was green and seasoned. But, not too far off? Mexican Shrimp Caesar Salad: corn / cojita / tomatoes / pepitas / croutons. $12.95. "A modern, south-of-the-border twist on the traditional Caesar salad. We put citrus-marinated shrimp over shredded romaine lettuce with corn, tomatoes, and diced red peppers. Add our ciabatta croutons, crumbled cotija cheese, toasted peptias, and chipotle-Caesar dressing for the final step and you're ready to dig into one fantastic salad." The packaging was done thoughtfully. Croutons were in their own little container so as not to get soggy, and the dressing too was on the side separately. The other elements were arranged on top of the lettuce in different sections: roasted red peppers over in one corner, seasoned corn in another. shrimp in another, cojita and pepitas in the middle, etc. For the most part, this worked well (the pepitas weren't crunchy anymore though, there weren't nearly enough croutons in that tiny container, and the shrimp were kinda slimy). The lettuce was the ingredient I was most worried about, and it was fine. Fresh, crisp, not browned, not soggy. Just standard romaine (not shredded as the menu said, but, regular chunks), and not quite enough of it (the ratio was just off here), but, the lettuce was fine. I appreciated the concept behind the slew of toppings: little cubes of roasted red peppers, cherry tomatoes, and seasoned corn, plus pepitas, cotija cheese, and of course, the croutons, but, in practice none worked out great. I don't really like roasted red peppers, and the flavor of the corn was horrible. I have no idea what the seasoning was that coated it, and in the photo online it showed regular, vibrant, yellow corn but mine was covered in something green. This made me sad, since, I do love roasted corn. The cotija was fine, a good cheese choice, and a nice amount of it. I love pepitas and looked forward to the crunch they would add, but, they had softened considerably inside the salad, and didn't seem toasted as described. Maybe they too should have been on the side? The croutons were actually awesome, really crispy, really flavorful. The menu description said they were "ciabatta croutons" but the ingredients listed "batard bread", so, uh, someone needs to at least figure out what country invented the bread they used. The problem? I had only 4 croutons. The tiny little container that kept them separate fit exactly 4 croutons. I wanted more. Many more. They were awesome. The other little container contained the chipotle-caesar dressing, and it was pretty good. Creamy, good amount of parmesan, and it actually had anchovy in it. It also had some kick, presumably from the chipotle, and this is what helped make the salad "mexican". I liked the dressing, and the amount provided was about right. The shrimp I feared would be rubbery, slimy, not cleaned, fishy, or all of the above. And ... the shrimp were fine. My salad contained 7, just like the photo. They were a little slimy, but, besides that, actually fine, cooked well, not fishy, and marinated nicely. My salad also came with a lime wedge to drizzle over, a nice touch. So, overall, it was fine, but it sounded better than it actually was. Still, kudos for fresh lettuce, not nasty shrimp, and very good croutons.